You Are Unique in the Eyes of God, Blessed Atman! The key to blessedness lies in being aware of blessedness. If your awareness is turned in different directions, towards what you do not have, or what you think or imagine you do not have, then this wrongly directed pattern of thought will make you unaware of the many things that you have. Each one is distinct and unique in the eyes of the Creator; there is none like that particular being, there is no second. So each one is precious and specially valuable to the Creator. In the eyes of God, therefore, each one is something special. This should always be remembered. No one can replace you in the role that you fulfil in God’s creation at any given place and at any given point in time. You are most necessary and indispensable for that particular set-up, in that particular time-space context. And therefore rejoice and be grateful to the Lord that He has given you a role to perform. Whether you perform your role perfectly and in a meaningful manner or not is irrelevant, because God expects each one to do what One is capable of, at any point, at any time. God does not expect an ant to haul a great timber as the elephant does in the forest. Nor does God expect the elephant to fly gracefully in the air as do swallows and doves. He expects birds to fly and He loves them for what they do. He expects elephants to fulfil their role, giving dignity to the forest and doing incredible jobs of strength. And He expects man to live as man. And each one in his own place, in his own sphere, can fulfil a task and gladden the heart of the Maker and contribute something to His plan on earth. No one is dispensable. No one is useless. No one is lesser in the eyes of God or in the eyes of those who try to avoid human judgement and human standards of criticism, who accept God’s creation as it is, because God created it. For them, whatever God thought fit to make, in any manner whatsoever, is perfect; there is nothing wrong in it, and it is acceptable. For them, whatever emanates from God partakes of His divinity and perfection, and therefore in God’s own plan, and in God’s own way, is fully complete. Things are as they should be. The Lord is in heaven and all is well on earth. This is the faith, the firm belief of those who have faith in the infinite love of God, who have trust in the infinite goodness of God and who are sure that in God’s heart they have a special and unique place. This is ever kept reserved for them and no one can take it away from them, because God’s infinite heart is large enough to hold the entire cosmos and everything within it. Thus knowing, we should have great comfort in our heart, great satisfaction and contentment. And that is the secret of inner joy, the key to blessedness and the pathway to peace, serenity and inner calm, where there is no fretting, agitation or restlessness. The peace of God pervades the entire earth; the peace of God pervades everywhere, without and within. The peace of God is the one great truth underlying all things, ever-present, ever-accessible and available, ever-full and inexhaustible. Try to live in the light of this truth, and the heart and mind will be at ease. Never compare and contrast, because there is no comparing and contrasting amongst unique things. Every little fledgling hatched from an egg is unique to its parents; so is each being unique in itself, for God is the parent of all. Hence, sages and saints and men of wisdom look upon all with equal vision. Therefore, rejoice that you are special to God in His infinite love. Rejoice that you have your own special place and role to perform in this creation of God. And rejoice that His love is immediately available to you, for He is not a remote reality, but He is the indwelling Reality, nearer to you than anything else on earth. And rejoice that within you is the peace of God as your own Self. You are God’s peace and you have a duty to perform, that is, to spread this peace which you are to one and all. Live to spread this peace! Shiva is often called the awareness and Shakti is the aliveness. Shiva represents the unmanifest and Shakti the manifest; Shiva the formless and Shakti the formed; Shiva consciousness and Shakti energy, not only in the cosmos as a whole but in each and every individual. Shiva is the sacred ground on which Shakti creates. The roots of Shakti is in Shiva. Without the stillness and groundness of Shiva, the creative potential of Shakti becomes unmanageable. Without the creative potency of Shakti, Shiva becomes an observer lacking the ability to create or manifest. 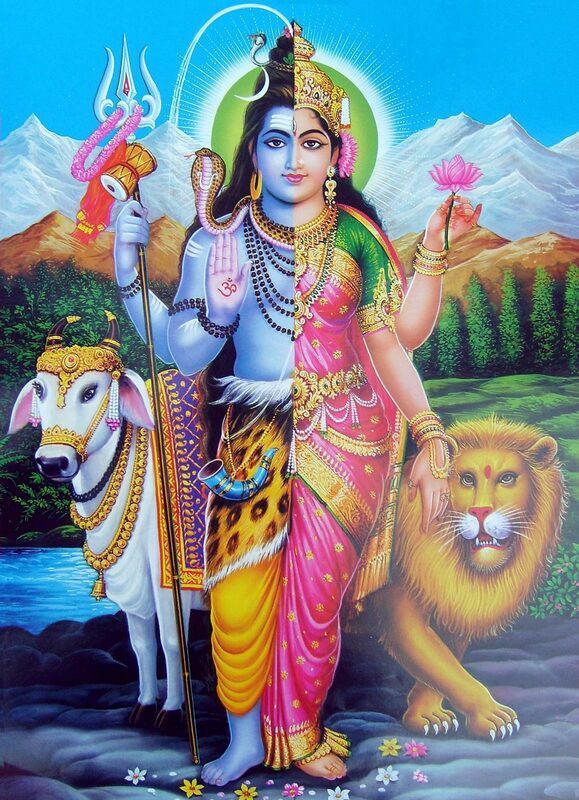 Shiva and Shakti merge to create Oneness and dissolve into this oneness where the masculine and feminine cease to exist and the pure consciousness of creation manifests in its place. Shiva and Shakti symbolize an intrinsic duality, balance, and the freedom to embody and dance with our devotion and prayer in any form. Though one is manifested and the other unmanifested, they are in the ultimate sense one and the same One is the principle of changelessness and the other, the principle of change – Shakti is change within changelessness while Shiva is changelessness as the root of change. The experience of perfect unity of the changeless and the changeable, the dissolution of duality, is the aim of Tantra, and thus of Yoga. Everything you see around you, whether physical, psychic, mental or whatever, is Shakti, both individually and collectively. This includes everything from a pebble to the sun. All manifestations of Shakti come from the underlying substratum, Shiva. Shiva and Shakti continue to unite and separate for eternity, just like we, in our humanness, oscillate between wholeness or oneness and separateness. One energy with many names and forms. There is one energy that keeps taking on new shapes and forms. In Tantra the name of that energy is Shakti, which is the manifesting, or feminine force that is actually one and the same with its only apparent companion Shiva, the latent, or masculine. Each time the energy takes on a new form, we give it a new name. Shakti becomes Kundalini Shakti, or simply Kundalini. Kundalini becomes the energy of Prana, which flows in patterns or channels called Nadis, and concentrates itself by forming intersections known as Chakras. The subtle energies condense and become known as earth, water, fire, air, and space, forming our experience of the gross world. With Kundalini awakening, the primal energy of Shakti awakens in its true form. Seek to experience that one energy. To know, in direct experience, that unchanging truth, the one energy that is the substratum of all of the names and forms, is one of the ways of describing the universal goal of spiritual life. It is the experience of the union of Shakti and Shiva, creation and its ground, feminine and masculine, even though they were never actually divided in the first place. It is like wetness that is never separate from water, sweetness that is never separate from sugar, and warmth that is never separate from sunlight. The omnipotent God is eternally existing in two aspects. What all We can see and sense in the external universe is the outer aspect of Him. The cause and effect of this boundless universe is the Inner aspect of Him. Though these two aspects are eternal, the outer – one is visible and ever changing on the other hand the Inner – one is invisible and changeless. From the Inner – most the Almighty power is ever expressing out all to appear, disappear and reappear in the whole universe. The man with all his sense organs, reasoning mind material and mechanical aids is unable to find out either the Outer – most of the universe or the Inner-most of himself. All the sciences and philosophies are trying unsuccessfully to probe towards either extremity. The material scientist’s vision is reaching some stellar region while he has actually visited and landed the lunar sphere. The spiritual philosophers and yogis have gone deep into themselves and there they have experienced some Divine mystic power. From this Inner experience of the Self or soul which is permanent, the knowledge of the two aspects of God has come to light. Eternal and a Blissful life is the goal of man. This life opens from the soul or Innermost of every one. So it is not bound against any religion. There is no hindrance to any body to live in any circumstance.